Critical Pedagogy and Race argues that a rigorous engagement with race is a priority for educators concerned with equality in schools and in society. A landmark collection arguing that engaging with race at both conceptual and practical levels is a priority for educators. Builds a stronger engagement of race-based analysis in the field of critical pedagogy. Brings together a melange of theories on race, such as Afro-centric, Latino-based, and postcolonial perspectives. Includes historical studies, and social justice ideas on activism in education. Questions popular concepts, such as white privilege, color-blind perspectives, and race-neutral pedagogies. Zeus Leonardo is Visiting Associate Professor at University of California, Berkley. He was previously Associate Professor in the College of Education at California State University, Long Beach and Visiting Professor and Acting Director of the Center for Multicultural Education at University of Washington, Seattle. His previous publications include Charting New Terrains of Chicano(a)/Latino(a) Education (2000) and Ideology, Discourse, and School Reform (2003). Introduction—‘Racism’ and ‘New Racism’: The contours of racial dynamics in contemporary America (Eduardo Bonna-Silva). 1. The Color of Supremacy: Beyond the discourse of ‘white privilege’ (Zeus Leonardo). 2. Whiteness and Critical Pedagogy (Ricky Lee Allen). 3. Maintaining Social Justice Hopes within Academic Realities: A Freirean approach to critical race/LatCrit pedagogy (Daniel G. Solorzano and Tara J. Rosso). 4. The Social Construction of Difference and the Quest for Educational Equality (James A. Banks). 5. Anti-racism: From policy to praxis (David Gillborn). 6. Critical Race Theory, Afrocentricity, and their Relationship to Critical Pedagogy (Marvin Lynn). 7. Class Dismissed? Historical materialism and the politics of ‘difference’ (Valerie Scatamburlo-D’Annibale and Peter McLaren). 8. 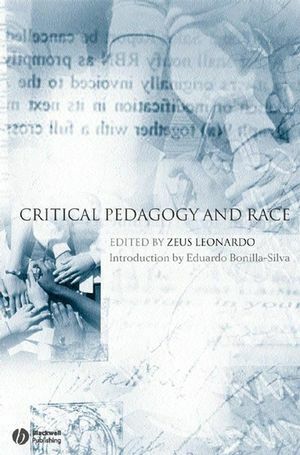 Actions Following Words: Critical race theory connects to critical pedagogy (Laurence Parker and David O. Stovall). 9. Race, Class, and Gender in Education Research: Surveying the political terrain (Michele Foster). 10. An Apartheid of Knowledge in Academia: The struggle over the ‘legitimate’ knowledge of faculty of color (Delores Delgado Bernal and Octavio Villalpando). 11 Postcolonial Literature and the Curricular Imagination: Wilson Harris and the pedagogical implications of the carnivalesque (Cameron McCarthy and Greg Dimitriadis).